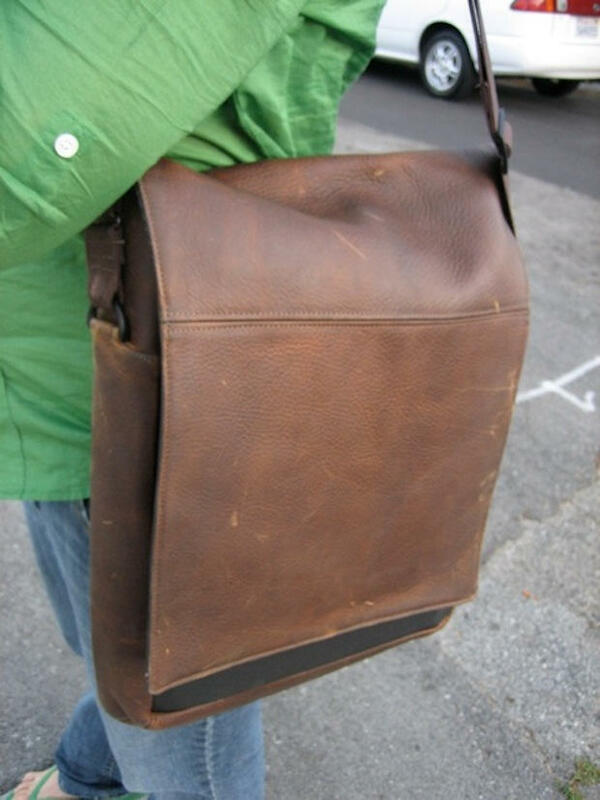 The San Francisco based company Waterfield presents the Muzetto laptop bag. 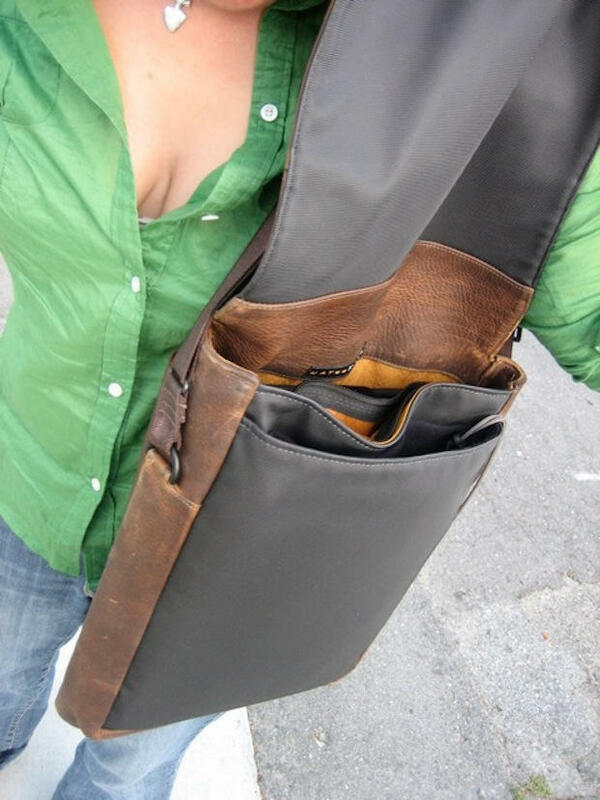 This “urban man bag” will make the geekiest nerd feel hip. Don’t be surprised when your fashion-forward girlfriend tries to steal it. Designed as a lightweight laptop tote, this bag is high quality; it’s made from distressed dark brown leather and offered in six accent colors. It’s a pleasant change from the over-used nylon of most laptop bags. I really like the gold liner which makes items highly visible. On my first use I accidently scraped the bag with my keys and made a horrible mark. But no worries! The well-oiled bag is designed to scratch easily for a distressed look. The marks will blend in time or you can just give it a good rub. The stylish Muzetto can be paired nicely with jeans or dress pants. The cost — $259 — is steep but you will feel like a million bucks wearing it. You can’t put a price tag on that. No need to stuff items higgely piggely in pant pockets. Everything now has its place. The Muzetto has three, large internal pockets and offers more space and less weight if you don’t put your laptop in it. The pockets easily fit several magazines or work documents. One pocket has a zipper and the other two small inserts are just the right size for a battery charger and a wallet. A single external pocket — easily accessible — is perfect for a phone or any item that’s needed quickly. Great news for anyone prone to misplacing their keys! Unlike most laptop bags, the Muzetto is lacking a built-in protective sleeve, which makes it less bulky. 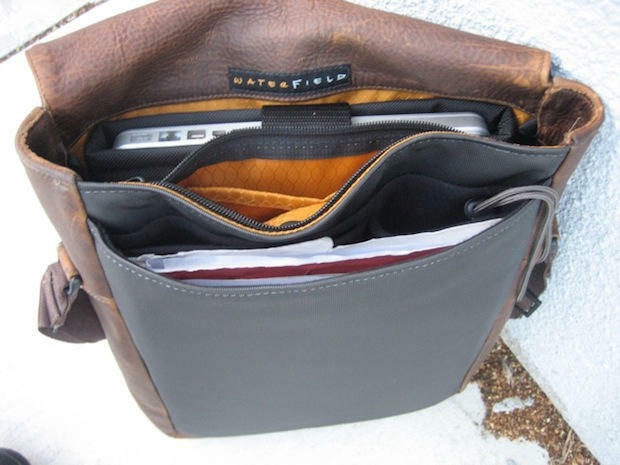 You may want to purchase one of Waterfield’s optional sleeves for $39.00 to protect your laptop. The Muzetto’s flap is weighted to hold it closed. Gone are hard-to-open clasps or noisy velcro strips. The shoulder strap is good quality and adjustable. A special feature of the Muzetto is the grip on the shoulder strap, which holds it securely in place while you move about. 1) 15″ Laptop Muzetto $259 / 15.5″ x 11.75″ x 2.7″ / 2 lb. 2) 13″ Laptop Muzetto $239 / 14″ x 11″ x 2.5″ / 1.7 lb.